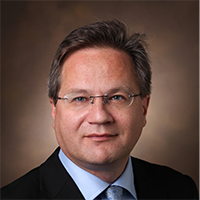 Dr. Lehmann is Professor for Biomedical Informatics and Pediatrics at Vanderbilt University, where he directs the Clinical Informatics Fellowship Program. He conceived and launched the journal Applied Medical Informatics, devoted to original research and commentary on the use of computer automation in the day-to-day practice of medicine, and he has served as its Editor-in-Chief since its inception. In 2009, he co-edited Pediatric Informatics, the first textbook on this subject. Dr. Lehmann served on the board of the American Medical Informatics Association from 2008 to 2013 and served two terms as the organization’s secretary. In 2010, he was inducted as a fellow into the American College of Medical Informatics, in 2014 he was elected to the American Pediatric Society, and in 2012 he became a Vice President of the International Medical Informatics Association (IMIA) in charge of the IMIA Yearbook and became the IMIA President in 2017. In 2010, Dr. Lehmann was appointed Medical Director of the Child Health Informatics Center for the American Academy of Pediatrics, where he was involved in developing the Model Pediatric EHR Format. Dr. Lehmann served on the Federal Health IT Policy Committee. He is the Chair of the Examination Committee of the American Board of Preventive Medicine, Subcommittee for Clinical Informatics.